“This is just the way it is,” said Seth, who’d been coming to Telluride since the early ’90s, with a shrug. “The way it’s always been.”A short while later on the sun deck of Bon Vivant restaurant and wine bar, I told Seth: “You know, I think I’m finally beginning to get it.” We sat drinking in the stunning views of the Wilson Range’s trio of 14,000-foot peaks and the improbable back-of-beyond feel with a Bordeaux in hand. I had come to skiing late and Telluride even later, though the destination held my fascination before I could hold my own on its steeps. The accolades hinted at the compelling contrast I was experiencing now: The Best Big Mountain and Little Ski Town in America. New Sheridan Hotel ’s Chop House, which, like its classic bar next door, dates to 1895. Foodies have plenty of options, from the inventive New American cuisine at 221 South Oak (run by chef Eliza Galvin of Top Chef season 10 fame), to the seafood-forward Asian tapas at Siam’s Talay Grille in Mountain Village. But the most unforgettable meal you’ll have is, perhaps fittingly, back on the slopes. At Alpino Vino, the highest restaurant in America at 12,000 feet, you arrive at the chalet via Sno-Cat, are welcomed with an aperitif and views of the sun setting over the Wilson Range, then settle in for a sumptuous five-course tasting menu of northern Italian dishes with generously poured wine pairings. 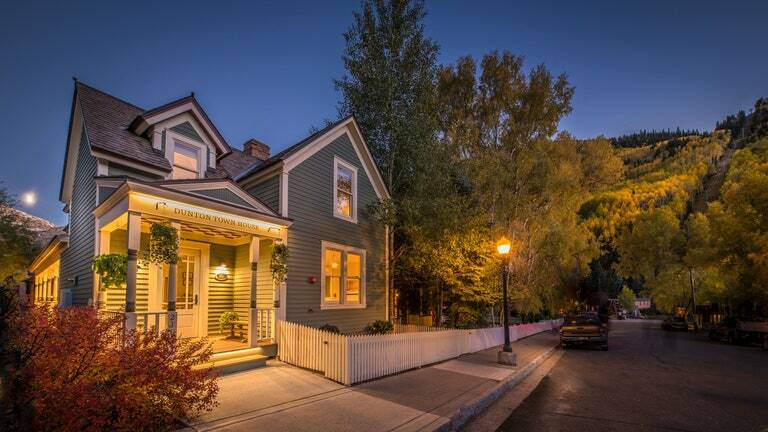 People drawn to Telluride tend love its smaller scale, and over the years, it has become a consciously casual exclusive enclave that has attracted attention-weary celebrities. Tom Cruise, Oprah, Daryl Hannah, and her beau Neil Young all bought homes here. Ralph Lauren and his progeny stay just outside the valley at Lauren’s Double RL Ranch, which gives the designer’s rugged clothing line its name and gives the Polo Lounge in New York and Chicago and the New Sheridan Chop House on Colorado Ave its world-class Angus steaks. An outpost of Dylan Lauren’s Dylan’s Candy Bar stands out in an arcade below the Madeline Hotel & Residences, Auberge Resorts Collection in Mountain Village, which is one of just a couple of high-end properties here, including Inn at Lost Creek. Dunton Town House. Opened in November 2016 by the owners of the revered Dunton Hot Springsresort and situated half a block from the gondola, the property is home to five guest rooms, perfectly appointed with a mix of Western antiques and chic Tyrolean fabrics. If it seems indistinguishable from the charming 1900s homes on South Oak street, that’s because it is one—though the building exterior it belies the luxurious renovated space within. Over a heaping breakfast spread of frittatas, homemade yogurt, candied bacon, and scones, my wife and I befriended Jon and Kathleen Peacock, who first visited Telluride over the holidays, staying in Mountain Village, and were so taken it with they decided to come back less than three months later and stay in town—this despite the fact that they own ski houses in Beaver Creek, Colorado, and Grindelwald, Switzerland. 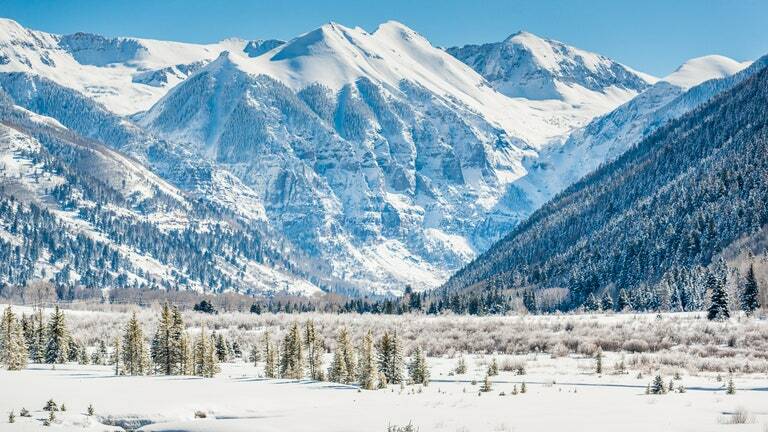 Telluride just topped our annual Readers’ Choice Award list for the best ski resorts in the U.S. and Canada—read on for the full list.